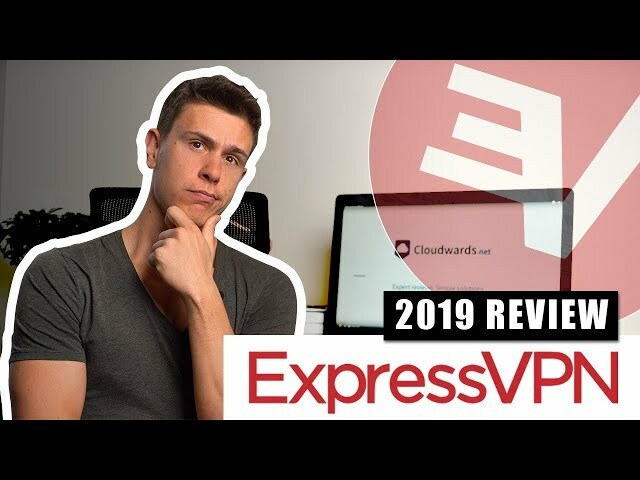 In this updated review, Cloudwards.net takes a look at one of its favorite providers, ExpressVPN. It's a fast and secure service that is guaranteed to get you into Netflix as well as other streaming services, while keeping your data away from prying eyes. To ensure our reviews are as current as possible, we’re going back and trying every virtual private network we’ve tested again for the new year. ExpressVPN has been our best VPN pick for a while and, after taking it through the gantlet again, we’re happy to say it still is. With its ultra-fast speeds, high security and easy-to-use interface, it is the cream of the VPN crop. In this ExpressVPN review, we’re going to talk about everything we liked and the few things we disliked after taking it for another test run. We’ll discuss features, pricing, user-friendliness, speed, security, privacy, streaming, server locations and customer support before giving our verdict. ExpressVPN isn’t perfect. It has a higher than average price tag and doesn’t include some features other VPNs have. That said, it has the best balance of all the aspects we look for in VPNs, making it our go-to recommendation for almost any task. As we’ll cover in the “user friendliness” section below, ExpressVPN is focused on providing a streamlined experience. An overabundance of features often hinders such a task– read our TorGuard review to see that — so ExpressVPN isn’t particularly feature-rich. Surprisingly, though, it manages to include essential features without bogging down the user experience. There’s a killswitch, which any good VPN should have, but ExpressVPN’s has an unusual feature. If you’re unaware, killswitches stop all internet traffic if the VPN disconnects unexpectedly. ExpressVPN’s is enabled by default, which is uncommon among VPNs, and it still allows devices on your local network, such as printers and servers, to function normally. A speed test is also included, which, again, is uncommon among VPNs. Instead of testing individual locations, ExpressVPN allows you to test as many locations as you want at once. Running a test on all servers takes about five minutes, and ExpressVPN will show the download speed, latency and speed index for each location as they are completed. The star of the show is split tunneling, though. Split tunneling allows you to send some data through the VPN tunnel while other data stays on your normal connection. It’s good for, say, running a backup at full speed while securing your torrenting client. Technically, you can set up split tunneling with any VPN, but the process is lengthy. Despite being such a useful feature, ExpressVPN is one of the few providers that offer it in-application — read our PureVPN review to see another. You can set it to only include selected apps in the VPN tunnel or only exclude certain apps. Keeping with ExpressVPN’s streamlined mentality, split tunneling is a joy to use. Outside of those three features, ExpressVPN doesn’t have much. There are protocol options, as well as DNS settings and IPv6 leak protection, which we’ll discuss in later sections, but the feature set is focused on those three. ExpressVPN covers the bases it needs to, though, and maintains an excellent user experience in the process. In addition to the desktop application, there’s a browser extension, which, for the most part, mirrors the local app. There are settings that make it like a toolbox for browser privacy, though. By installing the browser extension, you’ll stop HTML5 geolocation, disable WebRTC and automatically connect to HTTPS sites when able. In the past, we’ve groaned about ExpressVPN’s high price, but compared to overpriced options, such as Hide.me and Astrill (read our Astrill review and Hide.me review), ExpressVPN isn’t that expensive. You can save a few bones elsewhere, but for the level of service ExpressVPN provides, the price is justified. The monthly rate is bad, but it’s about the same as most top-shelf providers. It’s $1 more expensive month-to-month than NordVPN (read our NordVPN review), but a rate of anywhere from $10 to $15 is expected for a good VPN. Even if it is in line with other providers, ExpressVPN’s monthly rate is too expensive and provides little to no value. Though ExpressVPN is worth the money, its pricing puts it behind other providers. For example, Private Internet Access has a monthly rate around half the price and its service is only slightly worse (read our PIA review). The best point of comparison is CyberGhost. It charges the same per month as ExpressVPN but provides a higher value on long-term subscriptions. For instance, the annual plan is around half the price of ExpressVPN’s, as you can see in our CyberGhost review. Plus, CyberGhost, and most other providers, offers more simultaneous connections. The three you get with ExpressVPN feels limiting compared to almost any VPN on the market, especially considering the limited discount provided on semi-annual and annual plans. The downsides are somewhat offset by ExpressVPN’s 30-day money-back guarantee. Unlike other providers that advertise the same refund period, ExpressVPN will refund your money without question (read our VPN.asia review for a very different experience). Thankfully, you can try out the service risk-free, as ExpressVPN won’t make you jump through hoops to get a refund. ExpressVPN is solid as far as payment methods go. In addition to the standard credit cards and PayPal, ExpressVPN accepts bitcoin and many regional payment methods. It doesn’t accept cash like Mullvad, which you can learn about in our Mullvad review, but we’re content overall. ExpressVPN is the gold standard for user-friendliness. After clicking the “get started” link at the top of the homepage, all you need to do is choose a plan, enter your email address and select a payment method. There aren’t any annoyances, such as entering your name or opting out of a spammy email list. After you sign up, ExpressVPN will direct you to your account dashboard, which has an activation code and a link to download the installer. An important note here is that you don’t need to verify your email address, so you can use a throwaway one to maintain anonymity. You’ll be asked to set up a password in order to log in to the browser control panel, though. You will have a username and password, which you should store using the best password manager, but you’ll only need to recall them when logging in to the control panel. ExpressVPN uses an activation code to authorize the software on your device instead of asking you to log in. That lets it maintain user authentication security without asking for your login at every launch. After you answer whether you want ExpressVPN to collect diagnostic logs and tell it if you want the app to launch at start-up, you’ll be booted to the main screen. ExpressVPN doesn’t leave room for doubt about getting connected. The large, obvious “on” switch in the middle of the user interface launches with a tooltip that tells you to click it to get connected. By default, ExpressVPN uses a “smart” location based on your current location. If all you’re concerned with is getting connected, simply click the “on” switch and a green shield will glow around the button. If you’d rather choose the location, click “choose location” in the bottom right corner. ExpressVPN’s server navigation is basic, but holding to tradition doesn’t make it bad. In fact, it manages a simple approach to server navigation that’s easier than similar systems others companies have. Like other VPNs, it has three tabs: “recommended,” “all” and “recent.” You can also use the search bar to find a location. What sets ExpressVPN apart is how it separates locations in the “all” tab. Locations are broken up by region and country, so you can expand or collapse only those areas you’re interested in. You can also choose to select a region or country instead of a location, in which case, ExpressVPN will pick a location for you. Outside of the server selection, there’s the speed test and options menu, which are accessed through the hamburger menu in the top left corner. ExpressVPN’s options screen is a marvel. There aren’t many settings, but the ones present are important. The streamlined approach in the main interface carries over to it. Of note, you can change your protocol, set the killswitch and manage your split tunneling apps in the options menu. You can also find a link to install the browser extension for Chrome, Firefox and Safari, which lets you control ExpressVPN from your browser. ExpressVPN’s interface is suited for mobile devices and its superior ease of use is a big reason why it took top honors our best VPN for iPhone and best VPN for Android guides. From desktop to browser to mobile, ExpressVPN is streamlined and fluid. ExpressVPN is the fastest VPN provider we’ve tested. You can check out our speed test spreadsheet for the data. ExpressVPN exemplifies consistency and that’s no more clearly demonstrated than it is in speed. Below, you’ll find a table of five locations we tested for this review using speedtest.net. Though a lot of VPNs can stay fast when tunneling close to home, ExpressVPN is rare in that it stays fast over long distances. The worst performing location, Singapore, managed speeds that we’d expect from most middle-of-the-road providers, while all other locations performed better than average. The latency is also worth mentioning. ExpressVPN never went higher than 250 milliseconds, even when tunneling on the other side of the globe, so it’s a sure bet if you’re looking for the best VPN for gaming. ExpressVPN uses the gold standard in VPN security on your connection: AES 256-bit with OpenVPN. There are other VPN protocols and miscellaneous security settings that allow you to customize your protection, though. As far as encryption goes, you’re locked on AES 256-bit, which isn’t a bad thing, as you can see in our description of encryption. If you use other protocols — ExpressVPN supports OpenVPN, SSTP, L2TP and PPTP — your encryption may change, but you can’t dictate the level or type of encryption with any of them. If you’re interested in doing that, ExpressVPN makes several OpenVPN configuration files available, so you can dig around and change different aspects of security. As ExpressVPN warns in the control panel, you should stick to OpenVPN and SSTP because L2TP and PPTP have “weak security.” Thankfully, ExpressVPN includes reasons why you’d want to use a particular protocol so even novices can grasp the idea of switching between them. The “automatic” protocol setting, which almost always uses OpenVPN, works fine, too. The odd omission is IKEv2. It’s about as secure as OpenVPN and faster. It’s more easily blocked by firewalls, though. With ExpressVPN’s quick speed, there’s no reason you’d need IKEv2 over OpenVPN, but it’s still something you should consider. There are miscellaneous security settings that you’d never notice unless you dug around. ExpressVPN includes IPv6 leak protection, settings to only use its DNS servers and several privacy features in the browser extension. Plus, there’s a DNS, WebRTC and IP leak test in the application. We tested those tools, as well as running DNS leak tests of our own. In addition to passing all of them, ExpressVPN kept the number of redirects for DNS requests to a minimum. While other privacy policies are messy with legal details, ExpressVPN makes it clear at the top that it “do[es] not collect logs of your activity, including no logging of browsing history, traffic destination, data content, or DNS queries.” All ExpressVPN knows is that a user connected to a server. As we explained in our anonymous browsing guide, though, going invisible online isn’t as simple as that. There is a small amount of usage data and personal information collected for the sake of renewing your subscription, but none of it can be tied back to you. Other than that, all ExpressVPN knows about you is your email address. Though it’s unlikely the government would ask it for logs given its location in the British Virgin Islands, which has some of the best privacy laws in the world, if anyone got a hold of its data, they’d only find out that a user with an email address signed up for the service. You can bypass that with a burner email. Anonymous VPN connection and crash reports are also sent to ExpressVPN, but you can turn that setting off in the application. Even if you leave it on, there’s nothing to fret about because the provider anonymizes all crash reports, so no data is ever tied back to an individual user. Though we could summarize this section with “ExpressVPN doesn’t keep logs,” digging into the details is important. ExpressVPN’s transparency about what little it collects shows a respectful stance on privacy that few providers have. In short, the service is safe to use, even when bypassing strict censorship. ExpressVPN is our pick for the best VPN for streaming, so it’s no surprise that it performed well in this section. Netflix and BBC iPlayer went off without a hitch, which is why ExpressVPN took down the competition in our best VPN for Netflix and best VPN for BBC iPlayer guides. Across multiple locations in multiple regions, ExpressVPN accessed both platforms. Much to our surprise, ExpressVPN had trouble with Amazon Prime Video and Hulu. Though we were able to access both after bouncing around, getting into them wasn’t as fluid as getting into Netflix and BBC iPlayer. That said, Hulu and Amazon Prime Video are less of a concern than Netflix and iPlayer. Besides, after a while, we were able to access them. ExpressVPN gets into pretty much every country’s Netflix, though occasionally you’ll have to try out several servers. It’s fairly unique among VPN providers for this versatility, so ExpressVPN is the first provider you should reach for if you’re interested in streaming, even though it doesn’t have streaming-specific features, . ExpressVPN has a lot of servers — over 2,000 at last count — but providers such as NordVPN still come out ahead on pure server count. Unlike NordVPN, though, ExpressVPN has a bigger spread. Its servers are divided among 148 locations in 94 countries, making it an industry leader when it comes to accessing remote parts of the world. The only competitor that beats it in server locations is HideMyAss, which comes with a lot of downsides that ExpressVPN doesn’t have, as you can read in our HideMyAss review. A small number of ExpressVPN’s servers are virtual, which isn’t a big deal to us. That said, there is concern about the security of virtual servers, so beware of that. Out of all the servers in ExpressVPN’s network, less than 3 percent are virtual, so it shouldn’t be too big an issue. In addition to the usual places, ExpressVPN has excellent presence internationally. In the Middle East and Africa, which are underrepresented in VPNs, there are locations in Kenya, Egypt, Algeria and Israel. In the Asia Pacific region, you’ll find Macau, Nepal and Bhutan. There are few locations that ExpressVPN hasn’t covered. If you’re interested in a particular country, ExpressVPN makes it easy to request a new location. You can use live chat to request that it add servers to its network. There are no rules dictating when and if it will do so, but the option is there. As with other aspects of the service, ExpressVPN isn’t doing anything special when it comes to customer service, but it does provide plenty of support resources. The key is consistency, and ExpressVPN carries that into support. The knowledgebase covers most issues. ExpressVPN divides its support resources into two sections: setup guides and troubleshooting guides. The setup guides are excellent, with ExpressVPN covering almost every platform available in full detail. There are plenty of screenshots accompanying them, too, so you’ll always know what you’re supposed to do. That quality carries over to the troubleshooting guides. The name of the section is a bit misleading, though, because ExpressVPN includes troubleshooting guides and the FAQ in it. Just about every topic is covered, but ExpressVPN always includes a “talk to a human” link in case you need clarification. ExpressVPN’s main form of support is live chat and we tried it a few times during our review. Agents got back to us within a few minutes and, while they weren’t the most knowledgeable, they were helpful for directing us to knowledgebase entries or providing surface-level answers. Email support is available for questions the knowledgebase and live chat can’t answer. Though you shouldn’t need to email ExpressVPN, you can expect a response within a few hours. Even after putting ExpressVPN under the microscope again, it performed better than any VPN available. Its consistency sets it apart. Though other providers may offer more features or have faster speed in certain locations, it manages to do a little bit of everything well. That said, it isn’t the perfect provider for everyone. CyberGhost has more goodies in its interface and NordVPN can achieve a higher max speed if you’re willing to find a decent server. If you’re looking for a heavy-handed approach, make sure to read our other VPN reviews. What do you think of ExpressVPN? Let us know in the comments below and, as always, thanks for reading.